Dionysius, you run to her who prays. According to Gregory of Tours (History of the Franks 1.30): "Under the emperor Decius many persecutions arose against the name of Christ, and there was such a slaughter of believers that they could not be numbered. Babylas, bishop of Antioch, with his three little sons, Urban, Prilidan and Epolon, and Sixtus, bishop of Rome, Laurence, an archdeacon, and Hippolytus, were made perfect by martyrdom because they confessed the name of the Lord. Valentinian and Novatian were then the chief heretics and were active against our faith, the enemy urging them on. At this time seven men were ordained as bishops and sent into the Gauls to preach, as the history of the martyrdom of the holy martyr Saturninus relates. For it says: 'In the consulship of Decius and Gratus, as faithful memory recalls, the city of Toulouse received the holy Saturninus as its first and greatest bishop.' 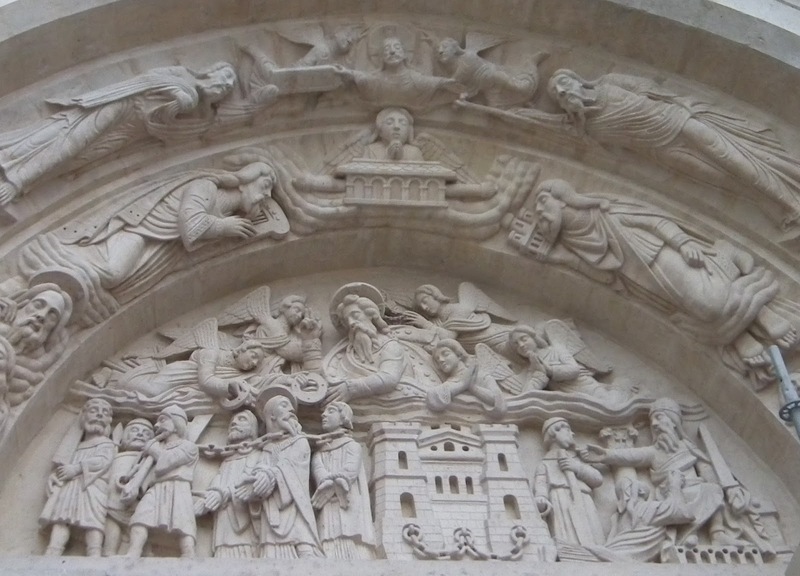 These bishops were sent: Bishop Gatianus to Tours (Dec. 18); Bishop Trophimus to Arles (Dec. 29); Bishop Paul to Narbonne (Mar. 22); Bishop Saturninus to Toulouse (Nov. 29); Bishop Dionysius to Paris; Bishop Stremonius to Clermont (Nov. 1), Bishop Martial to Limoges (June 30). And of these the blessed Dionysius, bishop of Paris, after suffering diverse pains in Christ's name, ended the present life by the threatening sword." Denis, having alarmed the pagan priests by his many conversions, was arrested and tortured, which included among other things an iron grill, hungry animals, and partial crucifixion. While hung on the cross he preached to the people Christ Crucified and Risen and the salvation brought through Him. After serving the Divine Liturgy in prison with the other Martyr's amid divine light, at which time Jesus appeared and, taking the Holy Mysteries from him, gave him communion as well, he was executed with his companions by beheading on the highest hill in Paris (now Montmartre), which was likely to have been a druidic holy place. ***** After his head was chopped off, Denis is said to have picked it up and walked ten kilometres (six miles) from the summit of Mont Mars (now Montmartre), preaching a sermon the entire way, making him one of many cephalophores in hagiology. ****** The site where he stopped preaching and actually died was marked by a small shrine that developed into the Saint Denis Basilica, which became the burial place for the kings of France. 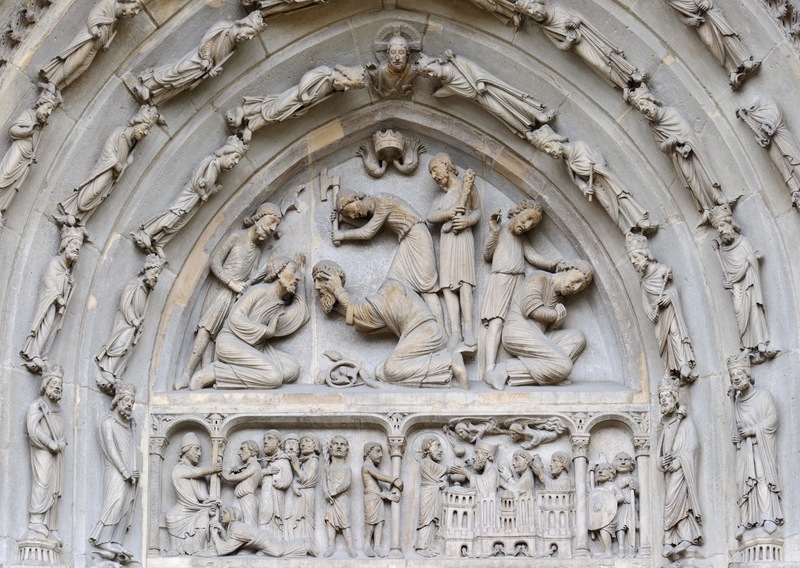 However, earlier accounts have his relics being thrown into the Seine, but recovered and honorably interred by a Christian lady named Catalla, not far from the place where they had been beheaded, which later became Saint Denis Basilica. 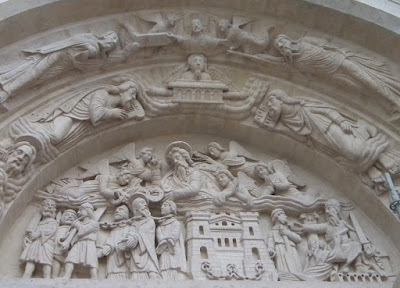 Veneration of Saint Denis began soon after his death. 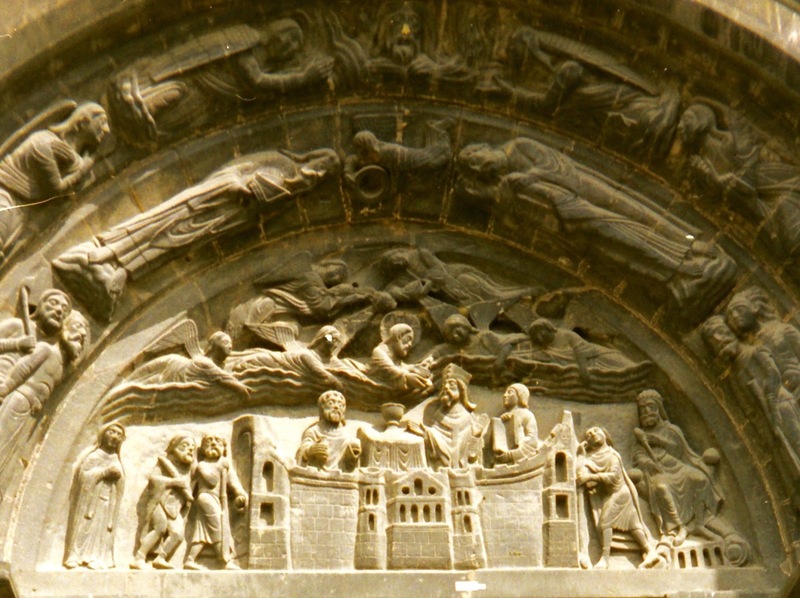 As mentioned, the bodies of Saints Denis, Eleutherius and Rusticus were buried on the spot of their martyrdom, where the construction of the Saint's eponymous basilica was begun by Saint Geneviève in 469 AD, assisted by the people of Paris. Her Vita Sanctae Genovefae attests the presence of a shrine near the present basilica by the close of the fifth century. 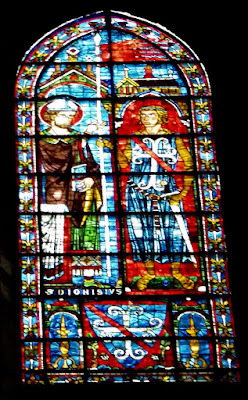 Around 644 the Frankish King, Dagobert, held St. Denis in high regard, so much so that he hid in the church of Saint Denis when he feared his father’s anger. 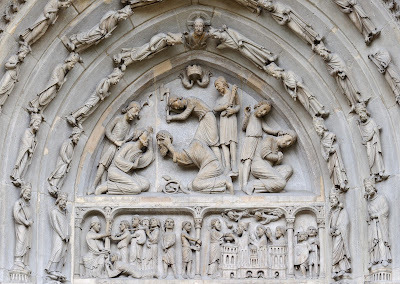 A holy man had a vision that when Dagobert died and his soul was being brought for judgement, several saints accused him of stripping their churches of valuables. 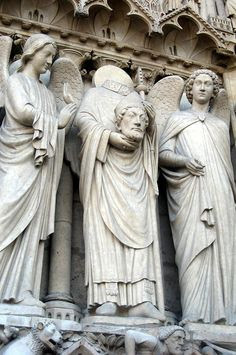 But the soul of Saint Denis protected him from their demands for punishment. In time, the "Saint Denis", often combined as "Montjoie! Saint Denis!" became the war-cry of the French armies. 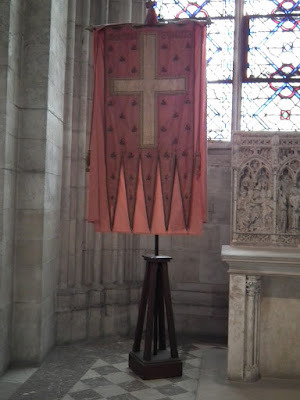 The oriflamme, which became the standard of France, was the banner consecrated upon his tomb. His veneration spread beyond France when, in 754, Pope Stephen II, who was French, brought veneration of Saint Denis to Rome. Soon his veneration was prevalent throughout Europe. St. Denis handing the oriflamme to a knight. 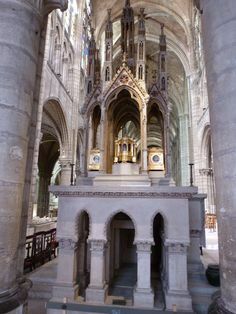 Abbot Suger removed the relics of Denis, and those associated with him Rustique and Eleuthére, from the crypt to reside under the high altar of the Saint-Denis which he rebuilt, from 1140-44. Denis is invoked against diabolical possession and headaches, and with Sainte Geneviève is one of the patron saints of Paris. by beheading with his companions. The identification of this St. Dionysius with St. Dionysius the Areopagite (Oct. 3) appears to be an error made by a ninth century writer, even though the Vetus Romanum Martyrologium clearly distinguishes the two. Around 814, Louis the Pious brought certain writings attributed to Dionysius the Areopagite to France, and since then it became common among the French legendary writers to argue that Denis of Paris was the same Dionysus who was a famous convert and disciple of Saint Paul. 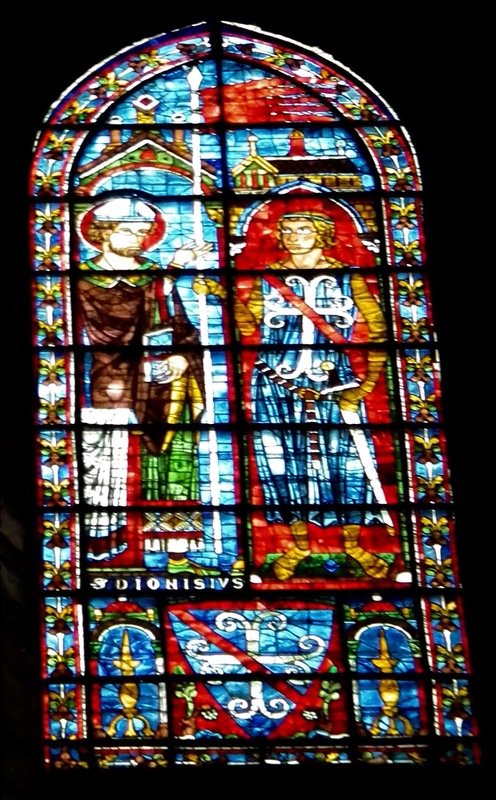 The confusion of the personalities of Saint Denis and Dionysus the Areopagite, was initiated through an Areopagitica written in 836 by Hilduin, Abbot of Saint-Denis, at the request of Louis the Pious. "Hilduin was anxious to promote the dignity of his church, and it is to him that the quite unfounded identification of the patron saint with Dionysius the Areopagite and his consequent connection with the apostolic age are due. "******* St. Symeon the Translator later included this confusion in his Menology. 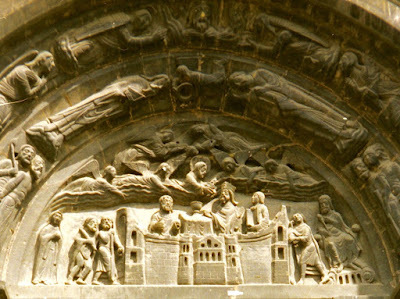 Hilduin's attribution had been supported for centuries by the monastic community at Abbey of Saint-Denis and one of origins of their pride. In Historia calamitatum, Pierre Abelard gives a short account of the strength of this belief and the monastery's harsh opposition to challenges to their claim. Abelard jokingly pointed out a possibility that the founder of the Abbey could have been another Dionysius, who is mentioned as Dionysius of Corinth by Eusebius. This irritated the community so much that eventually Abelard left in bitterness. As late as the sixteenth century, scholars still argued for an Eastern origin of the Basilica of Saint-Denis: one was Godefroi Tillman, in a long preface to a paraphrase of the Letters of the Areopagite, printed in Paris in 1538 by Charlotte Guillard. Most historiographers agree that this conflated legend is completely erroneous. * These iambic verses are from the Synaxarion of Saint Nikodemos the Hagiorite and are intended for St. Dionysius the Areopagite, whose mission to Paris and martyrdom is confused in this text with St. Denis of Paris. St. Dionysius the Areopagite is said to have been burnt to death in Athens rather than decapitated in Paris. 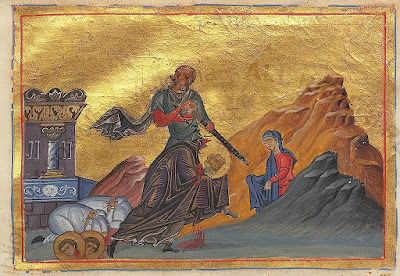 St. Nikodemos defended the confusion that St. Dionysius the Areopagite was the bishop of Paris and was beheaded there, based on earlier testimony. ** Lutetia was renamed Paris in 360 AD. *** Roman Paris lay on the higher ground of the Left Bank (Rive Gauche (Paris)), away from the river. **** Rev. Alban Butler (1711–73). "St. Dionysius, Bishop of Paris, and His Companions, Martyrs." The Lives of the Saints, Volume X: October. 1866. ***** The martyrdom of Denis and his companions is popularly believed to have given it its current name, derived from the Latin mons martyrium ("The Martyrs' Mountain"), although in fact the name is more likely to derive from mons mercurei et mons martis, Hill of Mercury and Mars. ****** This is a later legend detailed in the Golden Legend and Butler's Lives of Saints. Read also: "Cephalophore" and "Self-Cephalophore" Saints. ******* A. Hamilton Thompson, reviewing Sumner McKnight Crosby, The Abbey of Saint-Denis, 475-1122. Vol. I. In: The English Historical Review, 58 No. 231 (July 1943:357-359) p.358.